EFF as left-wing? So these are the sort of individuals that the usual critics of this set ally themselves with. Hilarious. Chicken Joe is Chicken. That confused me. I'm almost full on Libertarian and I love what EFF does. Left-wing, right-wing... Do these terms even have meaning in America anymore? How about pro-corporation vs pro-public? Then, it's very easy to see that the EFF is pro-public. Re: He went full retard. "never go full retard." Ha ha, I'm writing that down. Re: Re: He went full retard. I'm never up on the latest memes. My daughter always laughs at me because of it. 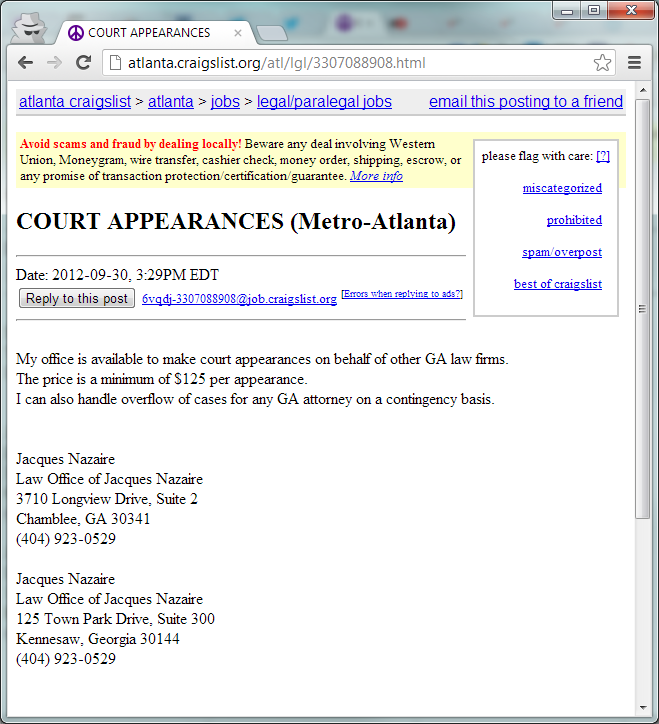 Craigslist is widely respected as the best place to find an experienced litigator, a gently-used futon, or someone to dress up like Herman Goering and poop on you. Hey, Prendateers: lie once, and the truth forever becomes your enemy. You�d do well to remember that. Dont.. get.. the.. prenda... ANGRY!! Someone warn China! They getting visitors soon, from under their feet! You can't get to China straight through from the US. It's mostly ocean with a few specs of land on the opposite side of the world. At best we can hope they drown themselves trying. Well, beside the whole reality of a thin shell of ground and underneath is lava and magma, yeah, of course you can't dig your way down. Btw, they don't have to dig straight down, they could go down in an angle. After watching their random wanderings in court, I'd be astonished if they came out anywhere except about ten feet away from where they started. Though I've never had any particular interest in legal matters, reading the whole Prenda saga so far has been kind of fascinating, the way watching someone sitting in a tree sawing through the branch they're sitting on is fascinating. Have Steele et.al. considered selling the TV rights for the story to the networks? It would be one hell of a comedy courtroom drama, and probably the only chance they have of raking in enough money to cover the costs in the end. It appears that there is enough information in the public record to create at least a two season miniseries, and no copyright applies. Maybe if you got a couple of the players to write their own lines they might deserve a credit and a token payment. From a creative standpoint, it would be hard to create something more bizarre. I have three candidates for leading roles, what do you think? Is slapstick the right way to go? I've always wondered if the adjective noun is same adjective actually originates from Tomoyo42's Room (definitely not safe for work) when Sakura and Tomoyo are throwing bricks at babies or if there was an earlier usage. You mean to tell me there is a place I can spend $125 to get someone to dress up like Herman Goering and poop on me? My god, I think my life is now complete. ...Logic dictates that the more Mr. Cooper testifies against those opposed to the EFF, the longer he is allowed to travel from state to state. This is what he uses the word "logic" to describe? I mean, HOW? Seriously, how do you miss the point that a Judge summoned someone to make a long trip w/ no funds? It makes you wonder if this guy missed the fact that Prenda's been digging multiple holes, & they've all started to merge. It's easy enough for him to miss that point, given the whole 'a judge ordered Cooper to appear' bit of information would make the rest of his rant on that topic pointless. So it's not so much a case of him missing the point, so much as intentionally ignoring it. Macadamia Nuts and something without a glaze from Legal Seafood. I can already hear the cries of "fresh fish". Terrorism (noun) - The use of violence and intimidation in the pursuit of political aims. The evidence suggests he was repeatedly threatened with legal ruin by the slick, entirely vile John Steele. Intimidation and threats of legal ruin are nothing new to copyright litigants (although rarely so brazen) in the pursuits of their political goals, thereby making the litigants, not organizations like the EFF, guilty of "terrorism". I suppose, then, using the sort of silly arguments the entertainment industry likes to engage in, if they can label copyright infringers as "thieves" than that makes copyright litigators "Terrorists"
It is amusing, in a dark way, that Prenda Law and its local counsel continue to portray themselves as the righteous defenders of intellectual property rights. Were that so, you might find support from them amongst attorneys and organizations in the business of bittorrent litigation and other pursuits of online pirates. You won't. At most, you'll find consternation that the Prenda Law enterprise has inflicted a grave wound upon the credibility of online piracy litigation across the United States. I consider it much more likely fear than consternation. Like any good extortion racket or pyramid scheme, it works for a while because it is new, and the players work subtly and keep their efforts limited. But like any such endeavor, eventually players get too bold, too greedy (it's simply the nature of people who engage in such endeavors). While Righthaven was suppose to be an exceptional anomaly, Prenda is showing this to not be the case. Even the ones doing this because they genuinely believe it to be right don't want the rug pulled back any more, because even they know how many dirty players there are in the game now. "How many dirty players there are in the game now"... How long is it going to take for even the most muleheaded of shills to realise, nobody thinks that these occurrences are "outliers" or "anomalies"? The EFF is a left wing organization which has some of the same goals as the anti-government group �Anonymous� as well as the terrorist group �Wikileaks�. So, can Wikileaks sue him for slander?